Barbara Cox is a highly regarded nutritionist, health article author and businesswoman. She became passionate about the importance of eating healthily during an eight-year stay in Japan, a country renowned for its low levels of obesity, cancer and heart disease. On her return to the UK, Barbara founded Nutrichef, a company that produces high quality healthy meals and delivers them to customers’ homes. 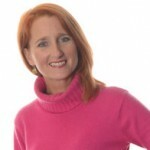 Through her consultations with Nutrichef customers across the UK, Barbara advises people with a range of concerns, including people wishing to lose weight, athletes training for sports events or people who simply want to know what it means to eat healthily. In 2008 Barbara was awarded the national title of Entrepreneur of the Year by the British Chambers of Commerce. She is a former Canadian national junior skating champion, a contributor to the book Fit for Motorsport and a keen charity fund-raiser who trekked 100 miles across the Sahara Desert in 2009 in aid of Help for Heroes. Barbara has recently launched a range of delicious, healthy flapjacks, which are already available in some Curves Gyms, Budgens stores, Oswald Bailey outlets and online at Amazon.